Update (Apr. 15): Yet another video update from SRAM president Stan Day on the company’s on-going hydro road disc and rim brake recall and replacement effort has arrived in our inbox. Day says that production of new model year 2015 brakes will commence in late April, and that consumers who opted for new hydro brakes (rather than cash and replacement mechanical brakes) will be first in line when those new brakes are ready to ship. However, he did not say when that might be. This seems to go counter to the last update (see the March 6 video update below) which promised a delivery date sometime in the second half of April. In a separate message delivered to the cycling media on Tuesday, representatives of SRAM wrote, “More technical updates and timeline information on when product will become available will be shared in the coming weeks.” Stay tuned. Update (Jan. 15): The timeline of SRAM’s on-going hydraulic road brake recall is becoming clearer. On Wednesday the Chicago-based company announced that new hydraulic brakes will be available in mid April. In the meantime, as previously announced, SRAM is offering mechanical brake systems installed at no cost as a stopgap until the new brakes are ready to be installed. These replacement systems are being delivered into the market beginning this week. SRAM asks consumers to contact their dealer so that they can get the proper parts on order and can schedule replacement. 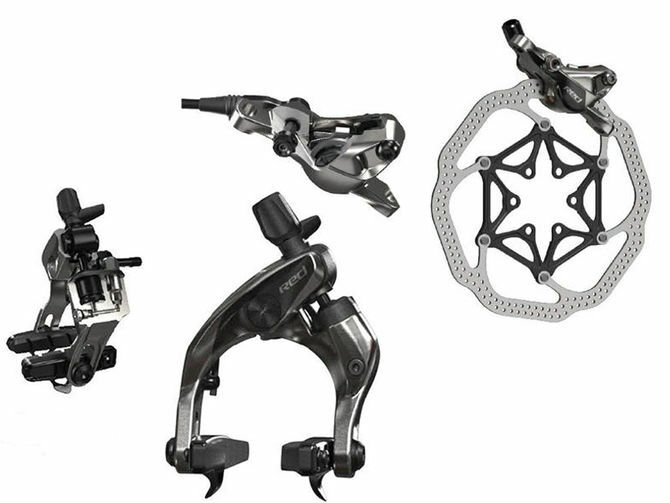 In addition to a mechanical brake system, SRAM is offering consumers the choice to upgrade to its new Model Year 15 hydraulic system, or if you prefer to keep the mechanical system, SRAM will provide cash reimbursement of $200. Either way you get to keep the mechanical system. “We hope that you will choose to upgrade and experience the benefits of a great hydraulic braking system,” SRAM said in a statement. Update (Dec. 30): In an effort to expedite the recall effort of its on-going hydraulic road disc and rim brakes, SRAM will provide a free exchange and installation service at the U.S. Cyclocross National Championships event in Boulder, Colorado next week. Amateur athletes whose bikes are equipped with hydraulic disc brakes can bring their bikes to the SRAM tech truck for the free replacement service onsite starting Tuesday, January 7 at 8 a.m. The service will run through Saturday, January 11. Transitionary Avid mechanical disc brake systems will be installed free of charge. Riders can refer to SRAM’s recall site for further details. “The recall has especially impacted the U.S. cyclocross community in advance of Nationals. Our race tech staff will work to be sure that any affected athletes bikes are race ready,” said SRAM global marketing director David Zimberoff. All riders will be serviced but those racing cross nationals will be prioritized. Athletes can register themselves for the recall onsite and the exchange service is expected to be same day. SRAM will have extra staff onsite to answer questions and assist riders SRAM road hydraulic rim brake exchange will also be available. Update (Dec. 20): SRAM has outlined brake replacement procedures for its ongoing recall of hydraulic road rim and disc brakes. As a stop gap until it’s resolved failure issues, the Chicago-based company will be sending out mechanical systems as a temporary replacement. SRAM hopes to have those replacement systems heading out the door by January 15, and is asking customers to work with their local bike shop. You can learn more in this extensive FAQ. SRAM is working with the Consumer Product Safety Commission to finalize a comprehensive and approved solution. Here is what we can commit for customers as we work through this process: Through the customer’s chosen Dealer, SRAM will provide a mechanical rim or disc brake system to replace a customer’s hydraulic rim or disc brake system. SRAM will provide a fair labor cost cash reimbursement to the dealer for all installs. SRAM will provide a voucher for product or cash reimbursement in an amount to be determined between SRAM and the CPSC. Update (Dec. 18): After announcing last week that it was recalling 19,000 sets of hydraulic road disc and rim brakes, SRAM has launched a website to help keep consumers up to date — and produced the video above with SRAM president Stan Day addressing the issue. The site — https://sramroadhydraulicbrakerecall.com — includes an FAQ section, updates section, contact info, a letter from SRAM president Stan Day, and most importantly, a registration page where owners of the recalled brakes are being instructed to input their information in order to start the recall and replacement process. Once someone registers, they’ll automatically receive email updates direct from SRAM. SRAM has yet to outline how long it will take to get replacement parts. Or what those parts will be, be it new hydraulic brakes or temporary cable-actuated systems. On Friday, SRAM announced that it was recalling its road hydraulic rim and disc brakes after there had been a spate of cold weather failures at cyclocross races during the previous weekend. According to SRAM, the master cylinder seal was failing in cold weather, which was resulting in a loss of braking power. Customers have been instructed to stop using the brakes immediately whether or not they ride in cold weather. At SRAM, we believe in the power of bicycles. Our mission is to create components and experiences that inspire consumers and expand the potential of cycling. We know that you too share this passion, and that cycling for you is more that just a hobby – but a lifestyle. In October 2013 at an OEM ride camp in Germany we discovered a quality issue with our new Road Hydraulic brakes. We analyzed the root cause and determined that we had a bad part that was generated from an unapproved process change by one of our part suppliers. This affected about 4,000 systems of the 38,000 systems that we had manufactured to that point. We were able to track the date range of the process change and put a fence around most of the product before it got to consumers. Last weekend a bigger alarm went off. There were a number of reports of brake failures at cyclocross races in sub freezing conditions. We investigated these failures and determined that the seal material we were using for the brake lever lost its performance characteristics in the extreme cold. We were able to duplicate the failure mode through testing. On Friday, December 13, 2013 we decided to quickly get notice out to the Cyclocross community and beyond to stop using the product and to issue a full recall. Safety was our primary concern. We are working alongside the US CPSC and other global product safety organization to register this as an official recall, and to abide by local laws and regulations. The recall now totals all 38,000 systems (the total production run) and at 2 systems per bike potentially affects 19,000 bikes less those systems not yet assembled. Of these 19,000 bikes our estimate is that there are 5,000 bikes in the hands of consumers. Hopefully this number comes down with more diligence. The balance of the bikes or systems are in warehouses or at retailers yet to be sold. While the numbers are limited in the grand scheme, these are high profile bikes at high profile Dealers. This is a particularly tough recall because many consumers bought these bikes with the Hydraulic as a primary feature and unlike say a wheel recall, they just can’t pop the quick release, stick another set of wheels on the bike and get back at it. Their investment in their new bike and their sport is essentially out of commission until we get them a replacement. The replacement plan may first be a mechanical disc followed by improved hydraulics. This scenario is extremely disruptive to cyclists, dealers and bike brands, and of course the new installs will have their own compatibility frustrations and potential for mistakes. The disruption will be hardest felt at a personal level by those cyclists and Dealers who purchased our components because of our Technology and our Brand Promise. They counted on us, and we have just disappointed them, shaken their confidence, and disrupted their cycling life or business. We have chosen to be a high performance product development company. This choice carries risk, and we have just found a very painful edge. Bike Brands, OEM Factories, Dealers and Consumers are going to be angry and dismayed at SRAM. We are going to continue to analyze failure modes and we will develop a redesign. At this point, we don’t know when this will be complete. I am leading a senior team meeting daily to complete a recovery and replacement plan for the channel and consumers. Because we don’t have immediate replacement product or know when we might be back in production with Hydro, this will especially disruptive. The cost will be high. There will also need to be compensation throughout the channel for the disruption. We don’t yet know how this will play out. We need to go over the top here in order to preserve our Brand and our Relationships. We are going to stay focused on improving our Quality and as part of our Strategy we will make operational decisions prioritizing Product Quality and Launch Quality. We have come a long way during the last several years and we have further to travel. For the next few weeks on Tuesday mornings Chicago time, we will post a technical and customer update about the recall on our website. I would encourage everyone to review this report so that we can all stay current and on the same page. There may be more frequent updates if helpful or needed. On behalf of the 2700+ employee’s at SRAM, I am truly sorry for this situation and we will do everything we can to regain your trust, business, and respect. I would be very surprised if these are out in mid April considering my LBS is still waiting on the mechanical brakes and shifters SRAM promised they would swap out back in January.